I was asked to go in for tests and treatment for a 'moderate flare' of Crohns disease. Purely due to the blood loss I had every day. I was expecting to be tested to find out for definite if it was the Crohns. 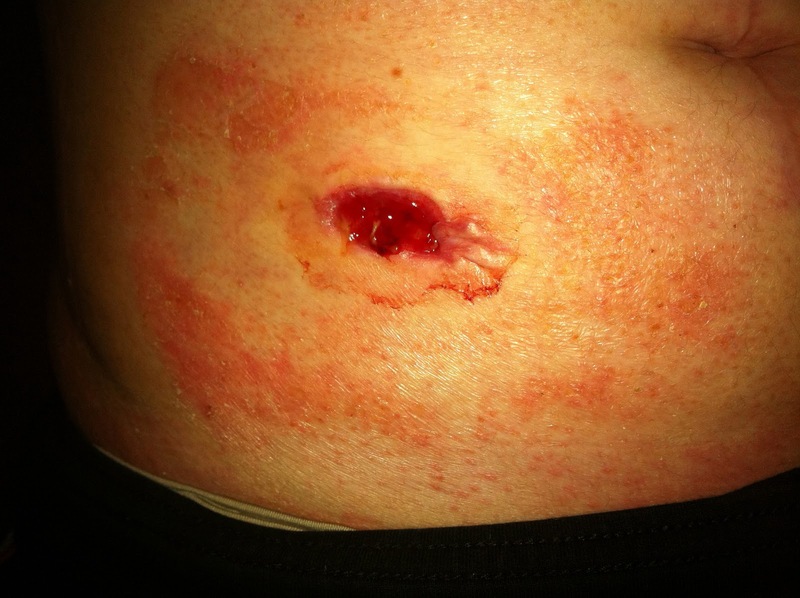 I say this, as my last flare (before surgery) I never experienced blood loss. I was incredibly sick, but never had any blood show. This FEELS different. My gut instinct (ha) is telling me this isn't just a straight forward thing. On my last appointment my CRP was at 7. On admission ( 5 days later) it was at 51. I was expecting tests done right then. But oh no.... steroids is the only answer! Lets fill her with them! Lets leave her on them! A week later I saw my consultant. Colonoscopy is finally booked. When for... who knows? Can you get where this is going?? Firstly, how are they supposed to scope me to see whats going on if they're suppressing whatever it is with steroids, then putting me on one of those drugs? But no...None of the above have happened apart from the first two. I just want to live my life! I don't want sympathy or people feeling sorry for me. I want to be healthy and happy. I was told today that to start on this drugs trial, they have to screen me. For this I need to be poorly. I need to stop the steroids. I said, so really, you need me to be as unwell as possible to do this? Yes is the answer. Why cant anyone understand that all I want is to get on with my life? Give me a damn drug that will work long term and not screw me up, then leave me be. My head is so scrambled from these tablets, I'm certain this makes no sense. I have more to say but today isn't the day. Desperation & Sadness- DRUGS TRIAL?!?!? Unfortunately this isn't going to be a happy post, but do I ever write when I'm happy? Easter 2014 marks 6 years that I've been ill. In that time I've had 2 surgeries, 1 ileostomy, 2 colonoscopys, 4 MRI's, 12 hospital admissions, 1 infected hematoma, dozens of X-rays, thousands and thousands of tablets, hundreds of injections and infusions... and that's just off the top of my head..
6 years on, after 4 years in remission.. I am now, no longer classed as being in remission. This makes me sadder than you could ever possibly begin to imagine. It fills me with fear and dread. The inflammation in my blood is low, up to 10 is in the 'normal' range. But 'normal' peoples inflammation should be 1 or below... mines a 7. I've had a barium follow through X-ray recently (Google if it your not sure) which showed no narrowing. So why am I so poorly? Why is there pain? Why is there sickness?... WHY is there blood? I'm having an MRI in 2 weeks, which scares me. They're the worst. I want to live my life. I've had enough of this. Having met with my Consultant, I've had my 6mp stopped. I am now on NO crohns medication. He wants me to wait and see what happens, if it gets unbearable I have Entocort to take.. I've had trouble with steroids in the past, becoming reliant on them. Turning into the Hulk... ya knoooow, all that jazz. Then, he wants to put me forward for a Drugs Trial. This new drug has no name. After a google search I found it has only been tested on monkeys and a 200 people so far. I sit here reading through the booklet from the hospital. It will go on for 4 and a half years. With 2 years monitoring after that. I will be nearly 30 when it ends. You CANNOT have children on it. Simply because they don't know what it does.. or how it will effect me. It states it could lead to, miscarriage, still birth or birth defects. This bothers me. I may only be 23, but at some point before I'm 30, I would like to have a family. I feel that is my purpose in life, I cant wait to be a Mum... I don't want it now... But I don't want a drug to stop that when I do. Then there are the risks..
Other than the fact they don't know what it will do to me, period. Or any other Crohns patient for that matter. They list one possible complication, involving a brain infection, which is fatal. It also mentions 'death' and 'loss of life' and 'life threatening' all on the same page. Do I risk everything I have and want on my absolute obsession with being cured? What are my other options? Apart from more chemo drugs or TNF-blockers. Why do I have to rely on drugs to keep me well and alive? My last post was along while ago, I always wondered why there was never any positive stories online about Crohns and Colitis....Turns out its cause they were out there trying to make the best of it. I've had a few hiccups, some trips to a&e, and changes in medication. Facebook friends have seen my rambling status' and probably wondered what on earth could be wrong with me now? I won't even get started on those so called 'friends' I once thought cared. Second chances aren't worth the hassle! 2013 has been quite the year! So, here I am now.. wide awake at 1am having survived all day off 3 hours sleep last night, suffering extreme nausea and tiredness like I've never felt before. This is a chemotherapy drug used to treat acute leukemia, but its also beneficial for the treatment and remission prolonging in Crohns and Colitis. It's similar to Azathioprine which I've been on since diagnosis. Starting this 6mp has made me feel like rubbish. I'm achey, sore, exhausted. Feeling sick. And it's only been a week. 1 more week and I start the fortnightly blood tests to check for bone marrow toxicity, inflammation and general blood levels etc. I'm not going to go into detail on it, if you wish to know more then feel free to google it! I'll leave it here for now, I will post more. But this will do for now, bit rusty at this blogging stuff now! Ok, so this is going to be a pretty rambling moaning post, I just need to vent how I'm feeling. I'm sick of being inside, I know I'm only 2 and half weeks post op and I need to be resting and whatever. But I am the most impatient fidget EVER. I can't just lay about doing nothing. I've ventured out twice, only to the super market and its left me drained both times. Why is it doing this!? My body just seems to shut down. Also I'm turning into a paranoid wreck. Leg cramps, I freak thinking it's a blood clot. Stomach pains.. crohns.. which I'll come onto in a minute. Another thing is my Mums new job. I'm so happy she got it and is enjoying it, cause I know how much she enjoys her job. But in her old job she only worked mornings, in this one its all day. So I'm on my own all day, every day. I don't mind my own company, but I'm getting kinda sick of myself to be honest. Also my wounds gone all funky, the nurse said it's looking 'snuffy' meaning starting to look a bit infected. So, you know the drill DONT LOOK DOWN IF YOU DONT LIKE GRAPHIC WOUND PICTURES. Gross isn't it.. You can imagine my reaction when I saw it.. I also received my discharge letter from my February admission. It said abdominal pain, bleeding, sickness and not eating or drinking.. diagnosis... Crohns disease flare up. If I had known that 4 weeks ago I would NOT of had a reversal. I'm kind of feeling a bit miss informed as I thought it was adhesions.. I've had pain all day today that feels awfully familiar. I'm taking all my medication so it's not that I'm being careless or whatever. I'm scared and again, paranoid. I'm barely eating cause I'm scared that whatever I eat could trigger it off. There, thats me! My MRI scan from last week. 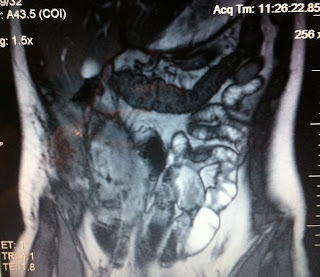 Thats all my remaining colon and the bottom of my liver. There are 457 pictures so I just chose this one for this haha! So I'm one cheese burger away from pain and puke.. I'm even scared of drinking my morning coffee at the moment! I just let everything get on top of me. It's a good job I'm on anti depressants so the full weight of how I'm feeling is numbed down a bit cause I dread to think of my mental state if I wasn't on them. I just feel like strangling whoever asks "are you ok?" I'm a Gibbs, I'm going to say "Yeah I'm fine"
When I'm really really not fine. Not at all. I'm scared if I'm honest. Really, really scared. The title 'never by halves' is what my Mum said to me, "you never do things by halves do you"
Less than 10minutes of writing my last post I had to go to hospital. I managed to hold on for my surgeon and went to see him at 6pm. We initially thought my join was leaking. But it wasn't that, but I had concerning symptoms and really wasn't well at all. He tried to touch my tummy around the wound and I yelped in pain. He couldn't even lightly touch the skin. He admitted me then and there and walked me upstairs to the ward himself. A new doctor came called Stavros, first name terms for reason I am about to tell you. I had so many injections, blood tests and IV's that I have no veins left. None. This poor doctor took 4 attempts at getting blood out of my arms and hands. Half success but the blood just dribbled out. They couldn't find my pulse either. "am I dead" I joked to the nurses. They had to call an anaesthetist down from theatre to get my bloods done. Typically being who he was, first attempt was a success, he couldn't see the vein but he could feel it. "It's a blind shot but worth a go" he said to me. After that it was waiting for the results which were rushed off to the labs. I was given pain meds as my temperature was really high. And I'm well known for never having a temperature when I'm ill, I have to be seriously poorly before my temperature goes up! At about midnight the nurse came in and said I was booked for an emergency CT scan for the morning. The next morning I waiting and Mr B (Surgeon) arrived back. My bloods were showing up some things that indicated infection and a few other things so a CT was definitely needed. Down in CT I layed on the table and they tried to get a vein for the dye and drip to help whatever it was show up on the scan better... They looked at my arms and hands and all the bruises and said the "oh you poor dear, oh thats awful, your a pin cushion" They had one attempt and failed. Stavros was called again. I asked the nurse if it was him who was coming and that my veins really annoyed him the night before. He walked in and rolled his eyes, wiped his forehand and said "hello Miss Gibbs, I've been dreading seeing you again" 40 minutes later he was still trying and failing to get a vein. In the end they gave up and said they couldn't do the CT without the dye but could do an MRI. I hate MRI scanners, I'm so claustrophobic. I lay on the table, they placed the boards on me and tied them down. Placed the panic button in my hand and I was pushed into the dome. 45minutes later they pulled me out. I asked if they could see anything on the scan and they said they could see the parts of intestine I was missing and could see whatever that 'tennis ball sized lump' was. Mr B and a radiologist analysed the results and decided I had an infected hematoma. Otherwise known as a blood clot. The one thing I'd been freaking out about and making sure my legs weren't crossed and I kept moving. I got, but in my tummy not my legs. It was in the muscle tissue layer so not deep inside. They put me on some strong antibiotics to help it and if that failed then it was either a big needle into my stomach to drain it or surgery. Luckily the antibiotics are working so far. Mr B came this morning and had a look at my wound, asked for a big swap, the nurse said "I swabbed it yesterday" he said "I know, its not for swabbing its a pokey tool" he looked at me and said "Sorry, I'm a surgeon, poking is in my nature"
I grabbed my Mums hand and he poked it. He wanted to make a path for the blood clot infection to get out. He managed to ram this stick half way inside me. So far in it got to the point where it didn't even hurt anymore. It just felt horrible! He said he could feel alllllllll the way down. Gross. He then gave it a massive squeeze, which hurt but shows the antibiotics are working as he couldn't even lightly touch the skin the other day. I'm home now, and feeling alright, it's still very painful. I'm annoyed that this is going to hold me back from flying for a little while. But as soon as I get the all clear I'm on that plane to Ireland!